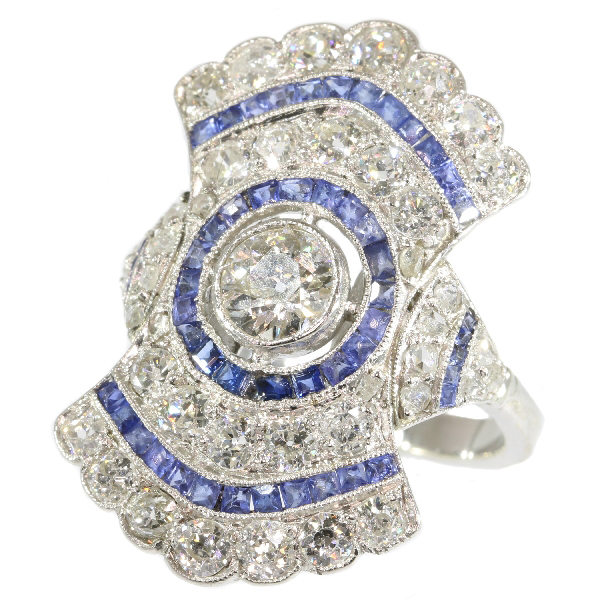 Radiating diamond and sapphire Art Deco ring: Description by Adin Antique Jewelry. Diamond(s): One old European cut diamond with an estimated weight of ± 0.60ct. (colour and clarity: I/J, i). 24 old brilliant cut diamonds with an estimated weight of ± 1.92ct. (colour and clarity: F/J, vs/i). 18 rose cut diamonds. We do not have the weight of the diamonds which is normal in our trade when it comes to rose cuts. Precious stones: 54 sapphires . We did not check if the sapphires are lab produced or not as this information has no influence on the value of this jewel. Natural sapphires and lab produced sapphires were both used in this era, rather more for their effect than for their intrinsic value.